Robert Carter is a regular customer of ours at Gainesville’s Union Street Farmers’ Market, and is now a contributor to our blog with these healthy and tasty recipes. He is a dietetics student at the University of Florida and we are happy to be sharing his love of vegan food with the world! Below are some suggestions Robert sent our way for preparing select produce items from this past week’s share. He will be sending updated suggestions for winter season produce items in the weeks to come. Stay tuned! Snow peas: Added to any meal in both raw and cooked forms, snow peas are a great way to introduce Vitamin C and iron. In addition to the vitamin and mineral content, a serving of snow peas brings almost no fat, but almost a fifth of the daily fiber prescribed in the dietary guidelines for Americans. In addition snow peas bring along vitamins A and K to round out their nutritional profile. Collards: Collards are great because they are efficient plants. The broad leaves provide a massive surface area allowing storage space for nutrients like: Vitamin A, Vitamin K, Iron, Calcium, and Manganese; without taking up a lot of space in your refrigerator. In addition to bringing massive nutrition in comparison to its caloric load, collards just beg to be cooked. Heat unlocks the real treasure trove of nutrition in the collard leaf making those vitamins and minerals above exponentially more available, while still packing a fiber punch to keep your gut happy and in working order. This hearty green can take the heat and has earned its rightful place in your kitchen. You can go the traditional route and cook it with meats, or use some less traditional methods like using aromatics (onions, carrots, celery, thyme parsley, etc.) when you cook them. 3. While your pot simmers cut the vegetables and combine in a bowl. 4. Add your acid and toss the veggies until everything is coated. 5. 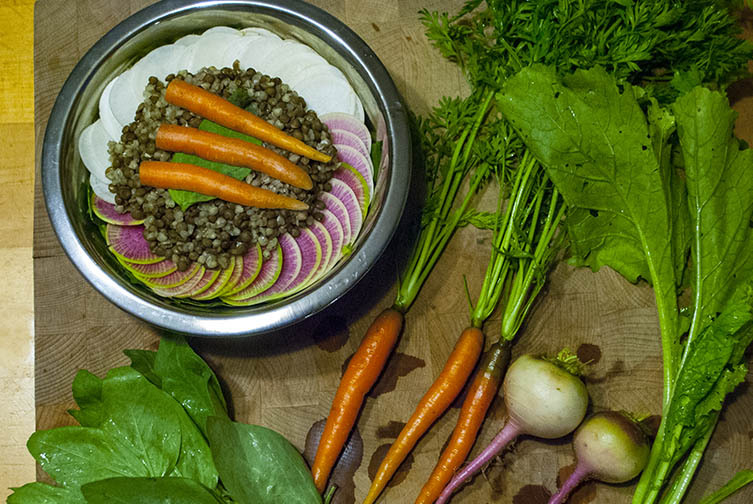 When your lentils and buckwheat are done add them to your salad, salt and pepper to taste and serve.